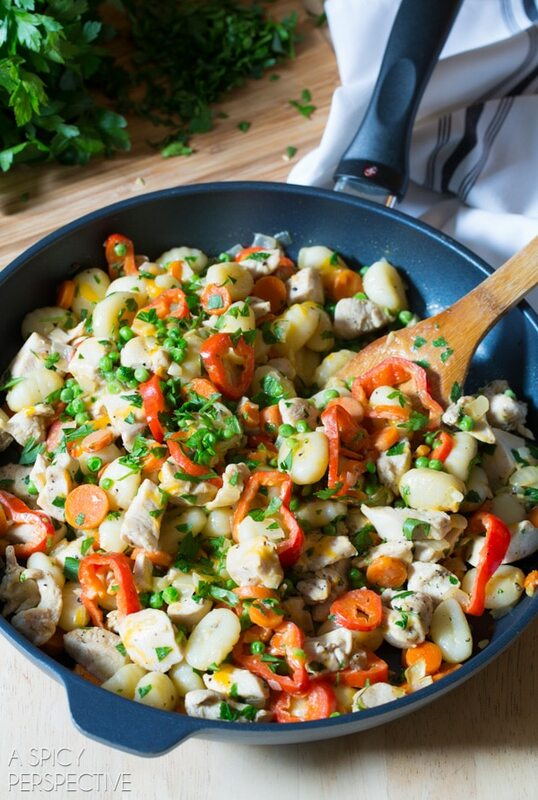 Homey Chicken and Gnocchi Recipe that cooks up in minutes in your favorite skillet! 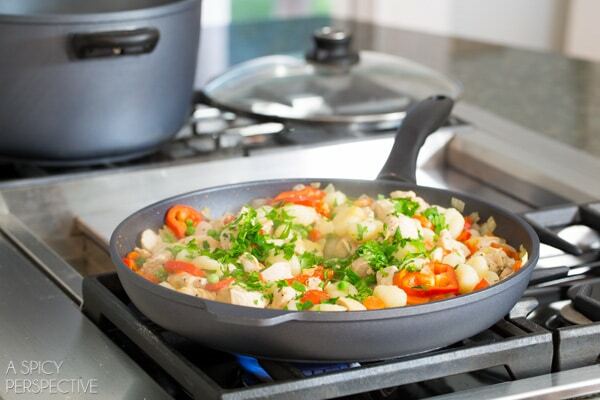 Our Chicken Gnocchi Skillet is loaded with veggies and tastes like home. 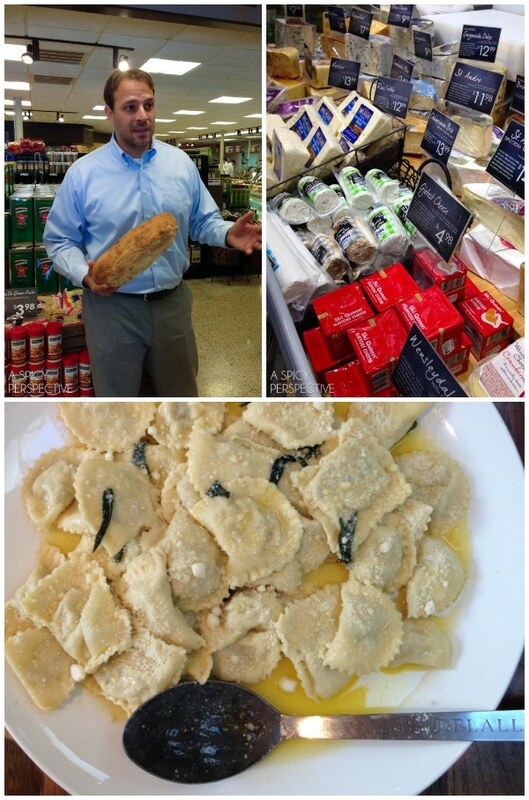 Just a couple weeks ago I went up to Pittsburgh to visit some of my favorite people, my friends at DeLallo Foods. 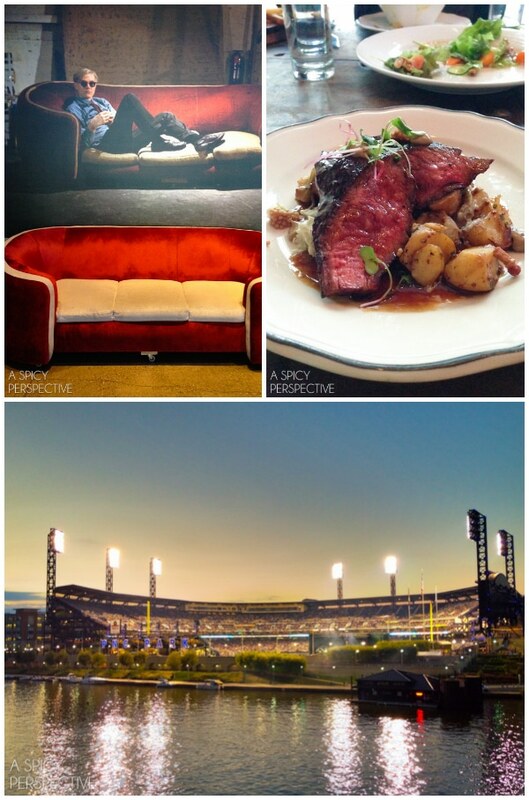 We spent an evening exploring the Andy Warhol Museum, dining at Butcher and the Rye, and watching the Pirates – Red Sox game from box seats. 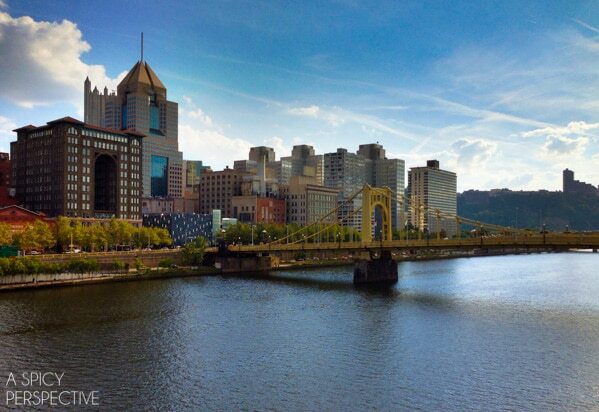 I love Pittsburgh… Go Bucs! Then we spent time with the DeLallo family, learning why their business is so unique, and of course sampling their amazing products. Truly, I have yet to find a DeLallo product I don’t like… and that is really saying something. After exploring the DeLallo store in Jeannette, Pennsylvania we settled into cooking mode, making the most ridiculously rich and buttery stuffed pasta you will ever taste. I’m going to have to try replicating this at home… I’ll get back to you with a recipe. 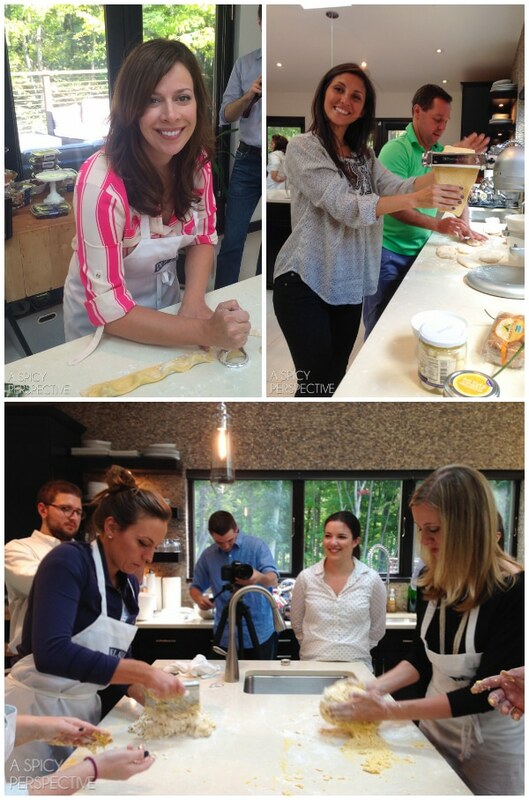 #DeLalloVIPs making homemade mushroom ravioli. I came home inspired to make lots and lots of pasta dishes, starting with my favorite pasta for fall DeLallo Potato Gnocchi. 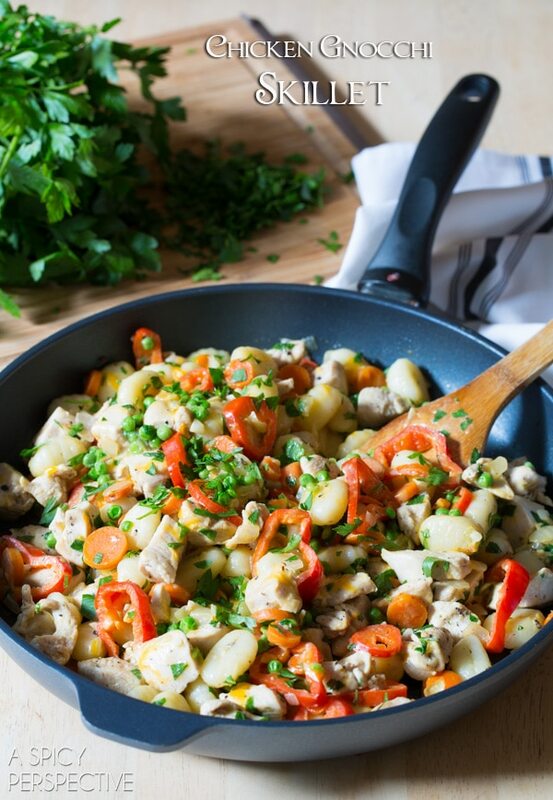 Today’s easy Chicken Gnocchi Skillet is a cozy dinner you can make in minutes with all the best flavors of home: fresh chicken breast, pillowy potato gnocchi, carrots, onions, sweet red Italian peppers, garlic… and a little cheese. I used DeLallo’s classic potato gnocchi, but you could use their whole wheat gnocchi, or even their gluten free gnocchi. 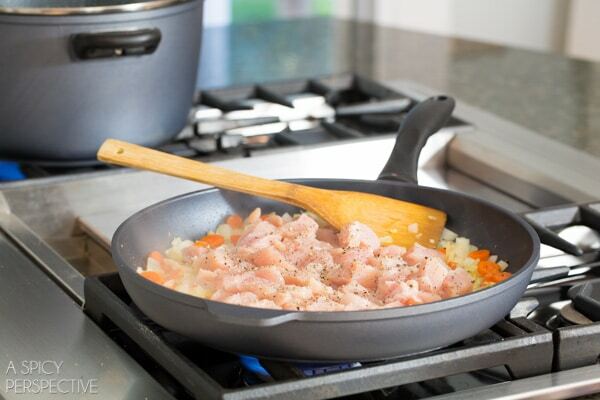 I started this comforting Chicken Gnocchi Skillet by boiling the gnocchi, and sautéing chicken and veggies in a large skillet. Once the gnocchi rises to the top of the water, scoop it into the skillet and finish the dish with sweet peas, a little parsley, and cheese. 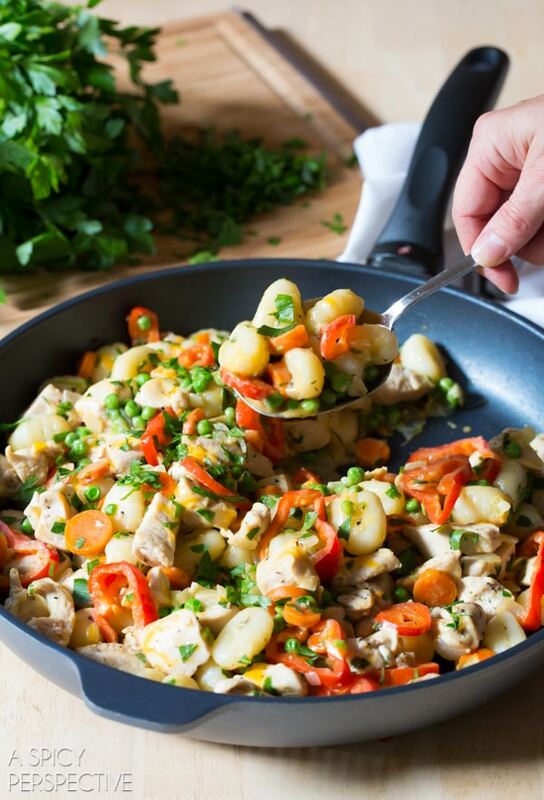 This Chicken Gnocchi Skillet is so easy, and oh so delicious. Who could resist? 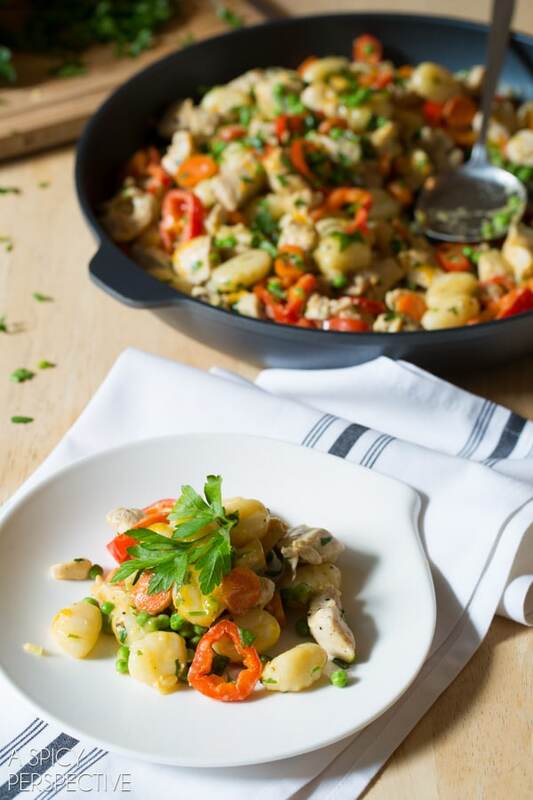 My family enjoyed this Chicken Gnocchi Skillet with a big green salad, topped with DeLallo SaladSavors. And of course they asked for seconds. Place a large pot of salty water over high heat and bring to a boil. 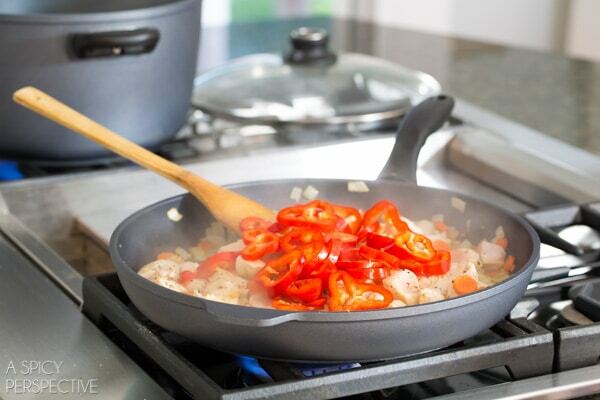 Place a skillet on another burner over medium-high heat. Once the water is boiling… Add the butter, onions, carrots, and garlic to the skillet. Sautee for 2-3 minutes, then drop the DeLallo gnocchi in the boiling water. Stir and bring back to a boil. Add the chicken to the skillet at the same time you add the gnocchi to the boiling water. Salt and pepper, then saute for 2-3 minutes. Add the red italian peppers and stir. After 3-4 minutes the gnocchi should start rising to the top. 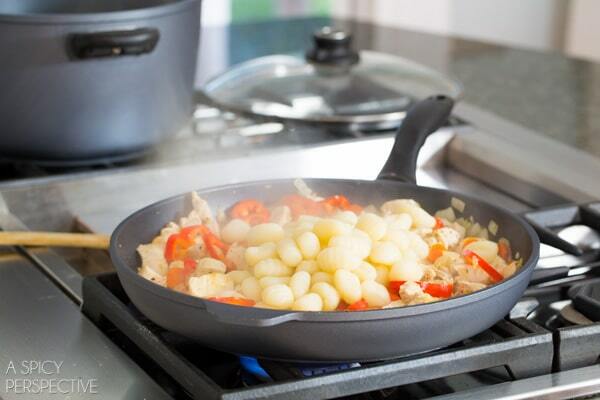 Use a skimmer to scoop the gnocchi out of the boiling water and into the skillet. Reserve the pasta water. Now add the frozen peas, Dijon mustard, crushed red pepper, and 1/3 cup of salty pasta water to the skillet. Stir to coat and thaw the peas. Add the cheese and parsley. Stir to melt the cheese, then salt and pepper to taste and serve immediately. Disclosure: This post is sponsored by DeLallo Foods. All opinions are my own. I made this Cheese Gnocchi with Potato and it was a big hit. 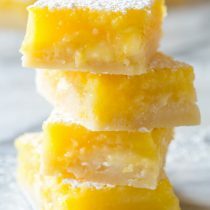 Super easy to make and delicious. The little bit that was left over heated up well. Thanks again for ANOTHER fabulous one pan recipe! i have never made gnocchi but would love to try this recipe.. Butter, salt, pepper and most any cheese! I have never eaten gnocchi, but it does look good. Love with brown butter and roasted butternut squash, season with some nutmeg and cinnamon. Yum! I love gnocchi with gorgonzola cream sauce or with pesto. My favorite way to prepare gnocchi is with my homemade Ragu Bolognese. It’s a very traditional Italian preparation and delicious! Gnocchi in a creamy soup is my absute favorite way to prepare / eat gnocchi. Ugh, SO dang good and satisfying! I like to add it to my chicken soup. Instead of putting noddles, I add the gnocchi. I love gnocchi with a simple butter sauce and garlic. I personally have never made gnocchi yet. But I love to have it in a creamy soup! I love gnocchi in soup. Don’t laugh at me… I order Delallo Gnocchi by the case from Amazon. It’s one of my favourite things ever. :D This skillet dish looks amaaaaazing! I have never made gnocchi before, but I would love to try a good recipe. This is the perfect combo of flavors, just lovely! I love to serve gnocchi with a sage butter sauce! I like my gnocchi with marinara sauce and plenty of parmesan cheese. With veggies and pasta sauce. I’ve never made gnocchi before but this look delicious! I like it pretty simple with gooey melted cheese and a vodka-y sauce. Mmm.. I love to make the copycat Olive Garden gnocchi soup! The gnocchi recipe looks great! This looks like an awesome dinner! I have never prepared gnocchi all though I have eaten it. Gnocchi with brown butter, parm and bacon!! I’ve never prepared it at home. However, the times I’ve ordered it at OHSO (neighborhood eatery) it has been a spectacular Mac & Cheese version with gnocchi instead of Mac! I like to smother gnocchi in a quick sauce of sweet peppers and tomatoes, add some fresh mozzarella, and bake in the oven. I love gnocchi with browned butter, parmesan and sage–YUM! I love sweet potato gnocchi with a sweet maple sauce! I have never had it, but recently bought a box. This recipe is just what I needed . I usually keep it simple – butter and parm cheese – but gnocchi is good any way! What a fun experience. I could eat pasta every single day. Love this gnocchi dish. This looks wonderful! Love pasta, it is a pantry staple at our house. I love gnocchi with fresh veggies and Trader Joe’s many cloves of garlic sauce. My first encounter with Gnocchi wasn’t too good. Maybe this recipe will make it taste better. I like gnocchi with butter and parm. I am a little embarrassed to say I have never cooked gnocchi at home! This meal sounds delicious! I am going to try this with my family. I like it with alfredo sauce! I gotta make this asap, it looks amazing! I prepare gnocchi with spicy italian sausage and kale. I have a great recipe for spinach ricotta gnocchi with a walnut gorgonzola sauce. We don’t have a good gnocchi recipe yet. Typically just with homemade marinara, but I love the recipe above! Love finding gnocchi boards at thrift stores. It’s like finding treasure! Gnocci with brown butter and sage! I have never tried before, but after seeing your recipe I think I will try it. With brown butter and cheese! Pesto comes in a close second. This dish looks delicious and it looks like you had a great trip! I’ve never prepared gnocchi, but I’d love to learn how. I love gnocchi in homemade marinara sauce with shaved parmesan on top. Simple but delicious! With a tomato cream sauce is my fav! I like DeLallo’s pastas. I got to try them when I did a House Party for Johnsonville sausage and a few of DeLallo’s pasta products were included in the box. I would love to win this, as I cannot find their brand in my local stores yet. love chicken and gnocch soup! I have not made gnocchi… I have ordered it at several restaurants. I love making gnocchi with gorgonzola! I love it topped with my grandma’s marinara sauce. So yummy! Thank you for the wonderful giveaway. Browned and crumbled spicy italian sausage with onions in a brown gravy, with gnocchi mixed in. I love gnocchi with brown butter and sage sauce with a little parm on top! I like a simple butter and herb sauce with gnocchi, but I also like it with a basil-garlic tomato sauce. I like gnocchi plain with salt and butter. This recipe looks great though – I’ll have to expand my gnocchi experiments! I’m about simplicity, too. Brown butterr and parmesan cheese is the way to go! Simple is best – butter, Parmesan and a little bit of fresh lemon juice! I love adding it to minestrone! I like gnocchi with a vodka cream sauce. I like my gnocchi simple. A light sauce with Parmesan, lemon, and olive oil. Sometimes a bit of rosemary. I have never had ‘store bought’ gnocchi. It’s been on my mind to try some. So this was the perfect post to present a product to me. I will have to search out to see if they sell in Washington State. I guess I’m pretty traditional, but I love it with tomatoes, basil and olives. 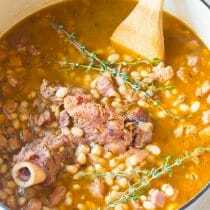 Giada De Laurentiis has a recipe that is pretty yummy for it! I’ve never prepared gnocchi before but this looks like a great way to try it! it reminds me of a comforting chicken soup. Wonderful for a fall night! I’ve only had gnocchi a few times one was a gnocchi in a tomato sauce another was a frozen sweet potato gnocchi in a butter & sage sauce, the frozen one wasn’t the best. 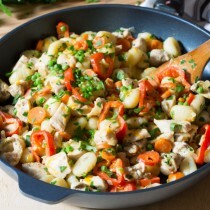 But I’m really looking forward to trying the chicken gnocchi skillet recipe it looks delicious. Crispy with a buttery sauce! The recipe looks very good. The prize package is very generous as well and it is nice to offer this. I have a good recipe for Chicken and Gnocchi Soup. It has spinach~carrots~celery~ and more. I haven’t prepared gnocchi often but when I do, I either just drizzle with olive oil and add some Parmesan. Sometimes, I use pesto. I love gnocchi with sundried tomato pesto and italian sausage! I like it browned in a pan with pesto. 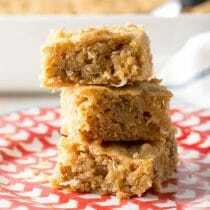 And this recipe looks delicious, I will be trying it too! I love gnocchi any way it comes! Brown butter and shallot sauce. Gorgonzola cheese sauce, with roasted veggies! I would love to try your recipe as well! I was so excited to see the gluten free version! I never thought I could enjoy gnocchi! I’ve never made gnocchi but I love eating it! Sounds like a new challenge in the kitchen! I love it with Pesto! Love this easy meal. 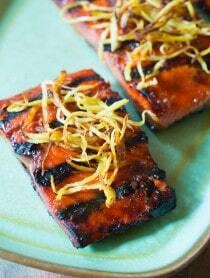 Bookmarking for a weeknight eats! My favorite way to prepare gnocchi is with a little butter, roasted chicken and top with crispy prosciutto! I love gnocchi in a brown butter sage sauce! Thanks for the chance to win (and for a great dinner recipe). Such a great weeknight dinner! This looks great! I’ve used DeLallo’s gnocchi and I loved it. I intend to try this recipe. Honestly, I’ve never prepared gnocchi. I would imagine it would be good in a skillet preparation with goulash flavors. DeLallo products really can’t be beaten! I spotted that gnocchi in the store the other day and almost bought it. It looks like I’ll be heading back there today! I’ve never tried gnocchi before! I would love to give it a try though – so I’d start with your recipe. baked with spinach & mozzarella! I love gnocchi, but I haven’t had it in ages. I’ll have to look for DeLallo the next time I head to the market! My favorite way to have gnocchi is mixed with pesto. I love it with basil, olives and tomatoes! YUM! Oh, love gnocchi with homemade bolgonese sauce or with sauteed shrimp and marinara! YUM! I have never made gnocchi before, but I think I will try this chicken recipe. Total yum!! There was a time when I had to make gnocci every night in a restaurant kitchen, but I need to make it at home for my kids. Gorgeous dish! Very cool – I like it with a little veggies & a light sauce. We love chicken and gnocchi soup- this recipe sounds right up my alley! I love gnocchi with butternut squash in a browned butter sauce with sage! just moved to the area and discovered the Delallo store. I’m a little sad that it’s ok the only one and when we move again, I won’t be able to take it with me. I love gnocchi with pesto or vodka sauce! I’ve never prepared gnocchi, but I’ll start with this recipe, which looks De-lish! I have only eaten gnocci at Olive Garden in soup. It looks like a fun addition to my cooking repertoire. Love gnocchi, but haven’t had it in a while – need to get back to it! Will definitely try this recipe and would love to win this giveaway. It’s hard to find DeLallo here, even in our Italian market. I have never made gnocchi- but I am getting ready to try a GF version!- This looks wonderful! I am definitely going to be looking for DeLallo’s gnocchi now – this looks amazing! I love making a chicken pot pie filling and using gnocchi instead of the crust! Mmm Delallo’s gnocchi is the best! I love serving it with just a simple tomato sauce and freshly grated parmesan. I love gnocchi with browned butter and sage sauce. Mmmm…love gnocchi!! And Delallo is the best!! I’ve really been wanting to make Italian gnocchi soup! This would be perfect! This looks like the perfect Monday night dinner. I’m in love!! Haven’t had it. Would love to try it. 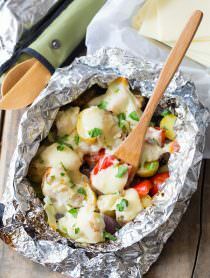 I’ve never made gnocchi but would love to try this skillet recipe! Looks delish. I would love to try gnocchi with a pumpkin sauce! Looks like such a fun trip to learn all about Delallo. This skillet is full of my favorites. I’ve never tried cooking gnocchi at home, but I may try this recipe. Didn’t think the boxed gnocchi would be any good. This looks like a nice fall recipe. I LOVE gnocchi, but have not really cooked it much! I mainly get it at restaraunts. This recipe will be happening in my kitchen soon though! Love gnocchi…..at home, I usually just toss it with some butter and lemon and olive oil and some sort of wilted green (spinach/kale/turnip greens) – delish! Loved our trip! So fun! DeLallo is the best! Gnocchi with roasted chicken and creme fraiche is the best! This looks incredibly delicious – totally my kind of weeknight dinner! I have not had gnocci except in a restaurant. I would love to try this at home! I am so glad you liked Pittsburgh!!! I like DeLallos Pepparazis stuffed with goat cheese. 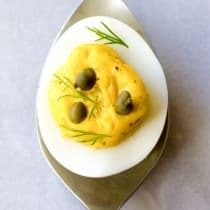 Easiest appetizer and tastes so good. I have not cooked Gnocci at home but I will now. Your recipe looks delishious! I’ve never made gnocchi and only recently had it for the first time. My brother made it and whatever he did to it was fab so I’d probably ask him for his recipe. I’ve only made gnocchi once and I swerved it with caramelized red onions and squash. Such a fun trip!!! Cheers to DeLallo! Love an easy skillet dish for weeknights! Gnocchi is one of my favs! Love it with bacon & onions with a sprinkling of Parmesan!! I love gnocchi with brown butter and a little bit of sage! Serious comfort food! How fun to go to the DeLallo headquarters!! I love Pittsburgh – such a cool town. Also love the long red peppers in this dish! What a tasty gnocchi meal! Yum! I love gnocchi! What a fabulous giveaway! I embarrassed to say that I have actually never tried to make gnocchi. BUT I did have some amazing gnocchi when I went to Germany over the summer. It was made with sun-dried tomatoes, olives, artichokes, and an amazing lemon butter sauce. I’d love to re-create that dish at home! Looks like a fabulous trip, Sommer. Yummy recipe and awesome giveaway! I love gnocchi, esp. DeLallo’s! I go to Olive Garden for my gnocchi. Don’t know how to cook it. I have never made gnocchi at home. This recipe is one that my family would love, so I’ll definitely have to make it soon! Butter and sage and a few grinds of black pepper! I like gnocchi with butter and mushrooms. I have eaten gnocchi but have never prepared it. Would love to try this dish! This looks amazing. My son and a friend are coming home for a weekend visit from college. He loves gnocchi. Going to make this for them. Thanks for the recipe and blog! I love making gnocchi with butternut squash and sage. I like my gnocchi in a red pepper sauce. I know, strange, but I have never had gnocchi. I would love to try it! I’ve never made gnocchi before but I would love to try some with browned butter. Here is where I admit that I have never eaten gnocchi–even though I am a pasta lover and have seen gnocchi in the stores. After many years of “getting dinner on the table” I am learning to cook for real and for fun (your blog is a great resource, thank you!) and branching out into undiscovered territory. I would love to try this dinner. i love to make pumpkin gnocchi! Great stuff!!! I have never prepared gnocchi before, but I think a tomato sauce with some basil would be delicious. Love gnocchi with gorgonzola sauce! I love gnocchi!!!!! My fave way is with homemade basil pesto! I love gnocchi! I usually just go for a super cheesy Alfredo. Thanks for sharing such a good looking recipe! Looks like you had fun! 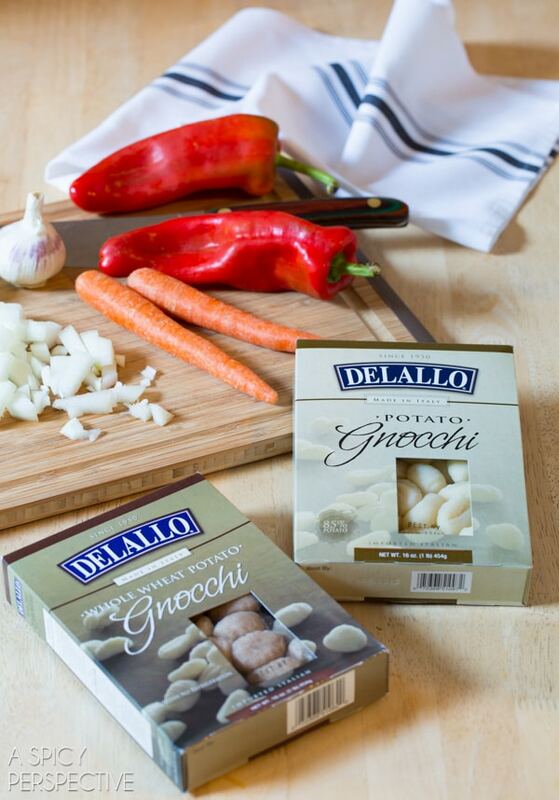 DeLallo has some great products – I didn’t know they had gluten-free gnocchi – will have to take a look soon. 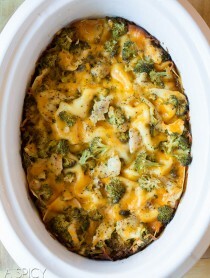 This skillet dish sounds like a wonderful comfort meal!